In this article tapping-mode atomic force microscope dynamics is studied. The existence of a periodic orbit at the forcing frequency is shown under unrestrictive conditions. The dynamics is further analyzed using the impact model for the tip-sample interaction and a spring-mass-damper model of the cantilever. Stability of the periodic orbit is established. Closed-form expressions for various variables important in tapping-mode imaging are obtained. The linear relationship of the amplitude and the sine of the phase of the first harmonic of the periodic orbit with respect to cantilever-sample offset is shown. The study reinforces gentleness of the tapping-mode on the sample. Experimental results are in excellent qualitative agreement with the theoretical predictions. The linear relationship of the sine of the phase and the amplitude can be used to infer sample properties. The comparison between the theory and the experiments indicates essential features that are needed in a more refined model. 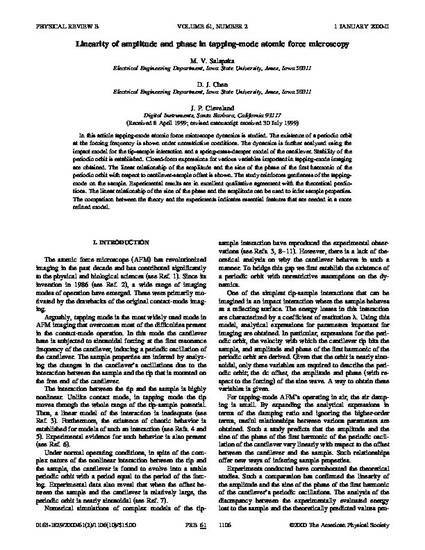 This article is from Physical Review B 61 (2000): 1106, doi: 10.1103/PhysRevB.61.1106. Posted with permission.